AMSAT’s next Fox-1 satellite, Fox-1D, is scheduled for launch on January 12, 2018 from Satish Dhawan Space Centre in Sriharikota, India. 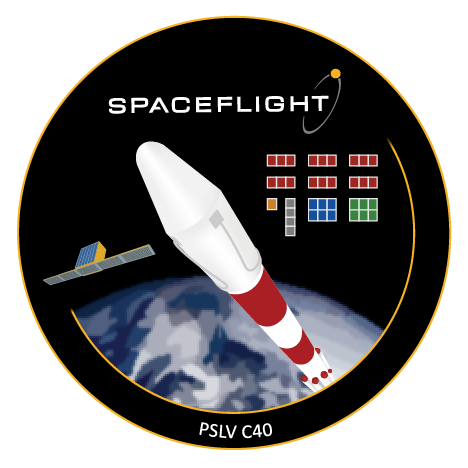 Fox-1D will launch as part of the PSLV-C40 mission on board a Polar Satellite Launch Vehicle with a Cartosat-2 series imaging satellite for the Indian government and 29 other payloads. ISRO’s mission brochure can be found at https://www.isro.gov.in/pslv-c40-cartosat-2-series-satellite-mission/pslv-c40-cartosat-2-series-satellite-brochure. The Spaceflight Inc mission patch. Fox-1D is likely represented by the single 1U CubeSat just to the right of the rocket. In addition to the Fox-1 U/v FM transponder, Fox-1D carries several university experiments, including a MEMS gyro from Pennsylvania State University – Erie, a camera from Virginia Tech, and the University of Iowa’s HERCI (High Energy Radiation CubeSat Instrument) radiation mapping experiment. Fox-1D also carries the AMSAT L-Band Downshifter experiment which allows the utilization of a 1.2 GHz uplink for the FM transponder. 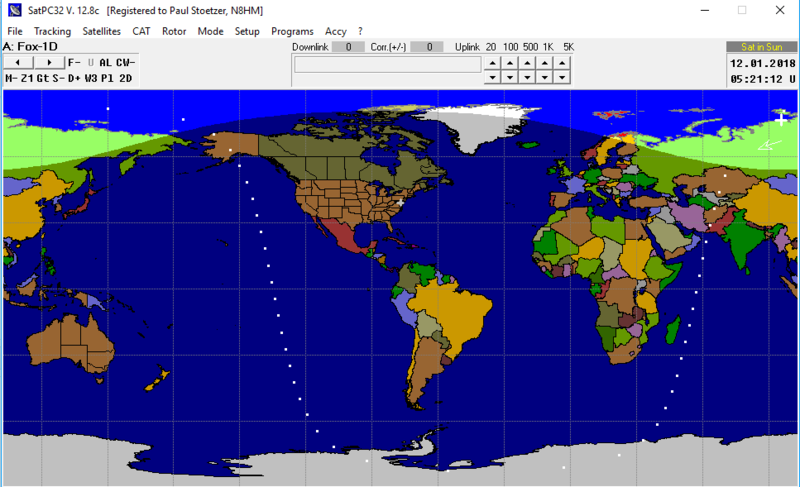 Telemetry, experiment data, and pictures from the Virginia Tech camera can be decoded using the FoxTelem software (https://www.amsat.org/foxtelem-software-for-windows-mac-linux/). Updated pre-launch and post-launch Keplerian elements will be distributed when available on the AMSAT-BB and AMSAT website. Please refer to your tracking software documentation for instructions on manually entering Keplerian elements. As there are 31 satellites on this launch, determining the final object number and adding the satellite to the AMSAT Keplerian elements distribution may take several days. Fox-1D’s deployment should occur at at 04:21:12 UTC. “First Veronica,” the first transmission from Fox-1D, is expected at approximately 05:22:12 UTC. Estimated location of “First Veronica,” the first transmission from Fox-1D. Participation in telemetry collection by as many stations in as many parts of the world as possible is essential as AMSAT Engineering looks for successful startup and indications of the general health and function of the satellite as it begins to acclimate to space. 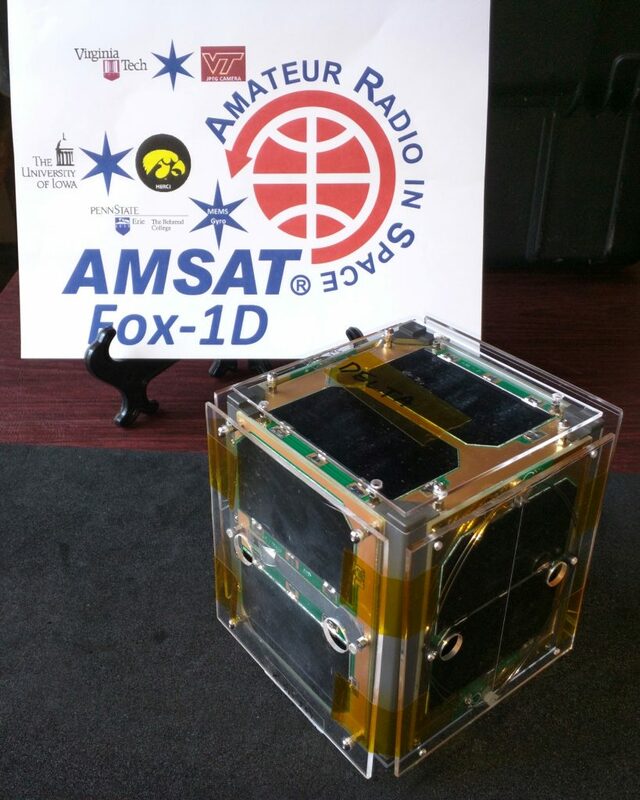 AMSAT will send a commemorative 3D printed QSL card to the first station capturing telemetry from Fox-1D. 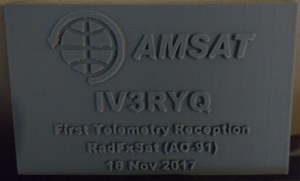 The 3D printed QSL card sent to IV3RYQ for receiving the first AO-91 telemetry. If you are capturing telemetry with FoxTelem please be sure that “Upload to Server” is checked in your settings, and that your “Ground Station Params” are filled in as well. In addition, be sure that the SOURCE button in the INPUT tab is set to AUTO . You can help AMSAT and everyone waiting to get on the air with Fox-1D tremendously by capturing Fox-1D telemetry. About 60 minutes after deployment, the satellite will start up in Beacon Mode. In this initial mode, the transmitter is limited to 10 seconds on time and then will be off for two minutes. For those of you capturing telemetry, that means that you will only see Current frames and no High or Low frames. The High and Low frames are truncated as it takes just over the 10 second limit to send two frames. Veronica will announce “Fox-1 Delta, Safe Mode” in Beacon Mode. If AMSAT Engineering is seeing nominal values from the telemetry you gather, the satellite will be commanded from Beacon Mode to Safe Mode on the first good pass over the United States. 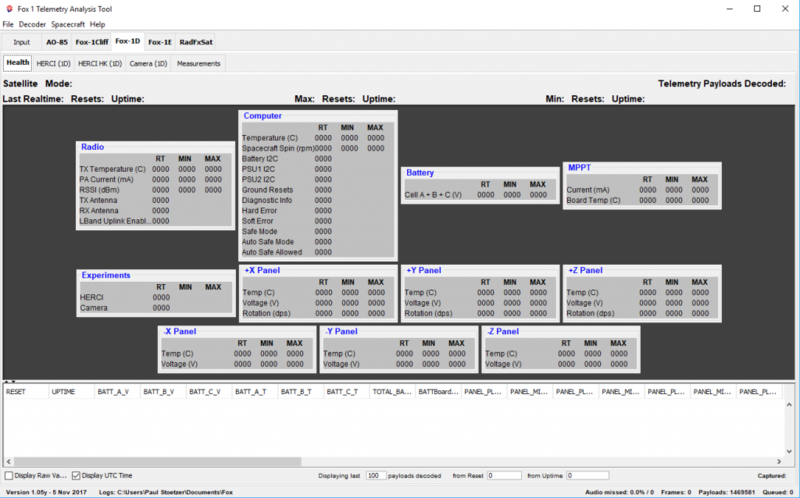 In Safe Mode, the satellite transmits a full two frames of telemetry (one Current frame followed by, and alternating each ID cycle, a High or a Low frame). The on-orbit checkout procedure for Fox-1D is similar to the procedure for AO-91. However, the various experiments on board Fox-1D, including the HERCI, Virginia Tech camera, and L-Band Downshifter will require more extensive testing than the experiments on board AO-91 and could take up to two weeks but could be less if users cooperate. It is very important, and good amateur operating practice, to refrain from using the transponder uplink so the on-orbit tests can be performed, including when the satellite is switched into Transponder Mode for testing. 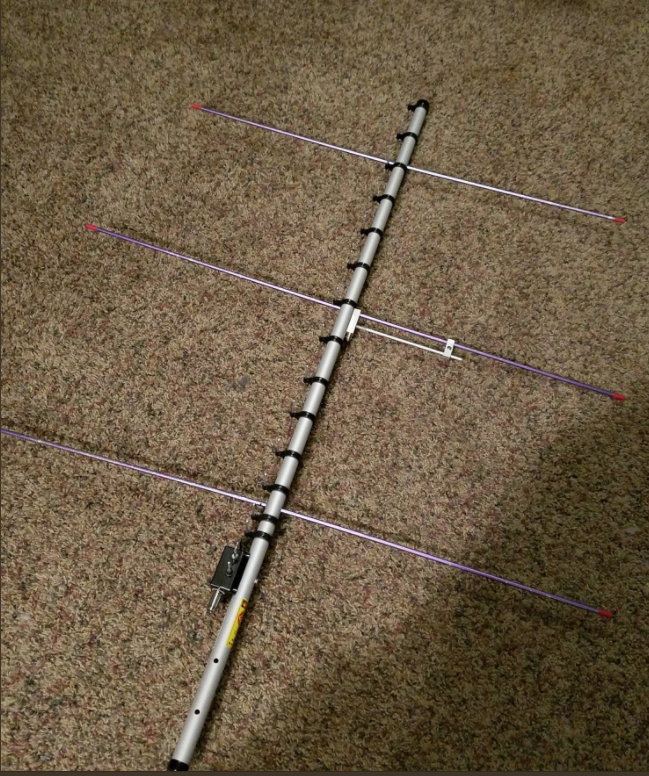 AMSAT asks all satellite operators to contribute just a little bit of your time by gathering telemetry, not using the transponder uplink, to help complete the progress of getting Fox-1D operating for the amateur radio community. Lots of hams put thousands of volunteer hours of their time into making Fox-1D happen. Just like any ham radio project you might undertake, AMSAT builds satellites. AMSAT volunteers do it because they like to, and when they are done, AMSAT freely shares their project with hams everywhere as is the spirit of amateur radio. While the U/v FM transponders on AO-85 and AO-91 are generally available for amateur use continuously, Fox-1D carries several experimental payloads, including the Virginia Tech camera and the University of Iowa’s HERCI that require the use of the Fox-1 high speed telemetry downlink. The FM transponder is not available in this mode. In addition, times will be scheduled for the use of the L-band Downshifter. The 435 MHz uplink is not available in this mode. Following commissioning, AMSAT Operations will periodically publish an operating schedule via the AMSAT News Service, AMSAT-BB, and AMSAT social media accounts. When enabled, the L-Band Downshifter will utilize an uplink of 1267.350 MHz. This device converts signals received at 1267.350 MHz and injects them into the satellite’s 435 MHz receiver. Since the 435 MHz uplink antenna is used to receive the 1267 MHz signals and may present a mismatch at that frequency, pre-launch estimates suggest that a power level of 100 watts ERP will be required for horizon-to-horizon access in Mode L/v. AMSAT Engineering will issue further guidance after in-orbit testing. Look for future articles on the AMSAT website and in The AMSAT Journal for equipment ideas and tutorials for accessing the L-band uplink. These charts list recommended frequencies pre-launch and are subject to adjustment after in-orbit testing. Note that the satellite’s Automatic Frequency Correction (AFC) circuit may reduce the need for precise adjustment. This should help with Doppler correction for mobile or portable operation, especially in Mode L/v. For example, many 1.2 GHz mobile transceivers are limited to minimum 10 kHz steps. Adjust your radio’s programming accordingly. 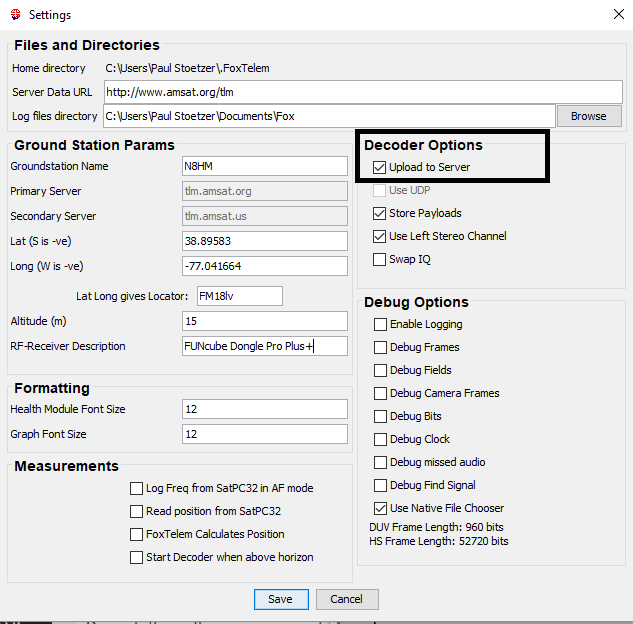 Although the AFC circuit allows for some error in Doppler correction, AMSAT Operations recommends utilizing the most precise Doppler corrections allowed by your equipment. 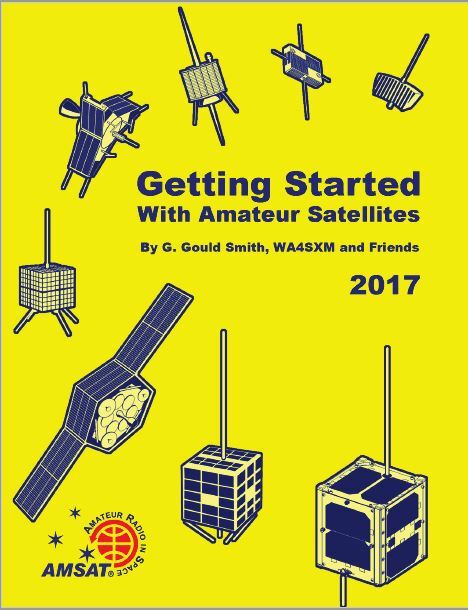 As part of the preparations for the launch of Fox-1D, AMSAT is making the “Getting Started With Amateur Satellites” book available for a limited time as a download with any paid new or renewal membership purchased via the AMSAT Store. This offer is only available with purchases completed online, and for only a limited time. A perennial favorite, Getting Started is updated every year with the latest amateur satellite information, and is the premier primer of satellite operation. The 182 page book is presented in PDF format, in full color, and covers all aspects of making your first contacts on a ham radio satellite.